We knew going into Sam’s most recent appointment with Dr. Karnani that he is allergic to tree nuts, sesame seeds and cats. We also knew there was the possibility that even though Sam had previously enjoyed peanut butter without a problem, his allergic reaction to a cashew in January may have triggered a potential future reaction to peanuts. Knowing all of that, we went to Akron expecting Sam to pass a peanut butter food challenge without any problem. The odds seemed stacked in his favor. 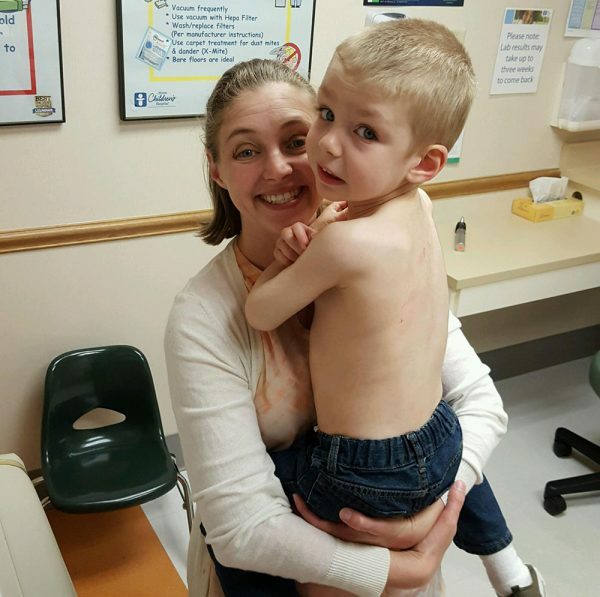 His previous love for peanut butter, a negative blood test, and the fact that peanuts are legumes and not tree nuts all made us fairly comfortable as we packed a jar of peanut butter with Sam’s toys for the 3-hour test at Akron Children’s. The moment Dr. Karnani entered, he told us that he was nervous. Yikes. That was not how we had planned for this appointment to begin. 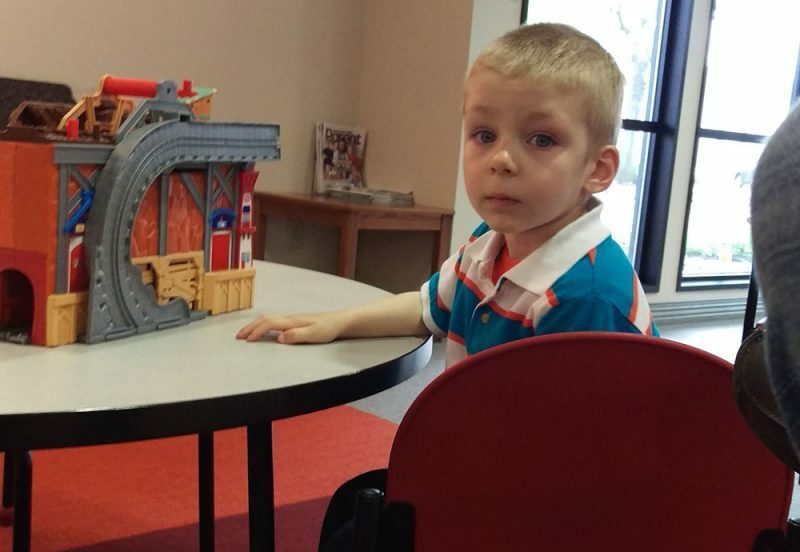 He explained that since Sam is only 2, it would be hard for him to really convey how he was feeling. He may not be able to explain to us the first moments of a reaction. True. Even though everything seemed to be pointing towards a totally safe challenge, as Dr. Karnani continued, our feelings matched his. It may be just too risky. That is what I like about Dr. Karnani. He reviewed Sam’s case before we got there and did what he felt was right, and even though it was different from what the plan had been a few weeks before, he did what really mattered on the day of the test—Dr. Karnani kept Sam safe. He suggested a skin test, just to make sure. If the skin test was negative too, Sam would be snacking on his first “dose” of peanut butter in about 20 minutes. If it was positive, we’d know within 10-15 minutes, and we’d need to think about whether to continue the testing or not. We thought that was a great idea, and Sam showed everyone his muscles as we took off his shirt for the skin test. Three little spots were placed on his skin—a drip of something representing peanut, and a positive (histamine) and a negative. And then we waited. And watched. It was positive. After 5 minutes it was obvious, and by the 10-15 minute marker we were already discussing Sam’s future options. In a few years, if both the blood and skin tests are negative (or at least a little LESS POSITIVE!) and when he can better explain what and how he’s feeling, he can try again. For now, we’re maintaining a host of epi-pens and making sure that we know every ingredient in everything he eats, along with what it may have come into contact with before it makes its way to him. Anything with nuts or any kind of seeds is just too dangerous. We’re learning, and in the process, we’re teaching Sam so that someday he can keep himself safe, too.